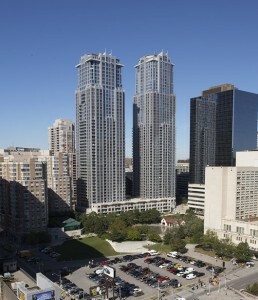 Luxurious Building Located In One Of Toronto’s Most Sought After Neighbourhoods. This Stunning Unit, Situated On The 50th Floor, Offers Breathtaking Views Of The Lake During The Day And An Illuminated City Skyline At Night. The Very Well Laid Out 870 Sq Ft, 1-Bdrm + Large Den Boasts Underground Access To Subway And Shops. Walking Distance To Hospitals, Financial District, Universities, Govt. Den Currently Used As Bedroom With Master As Home Office/Media Room.